Joint Builder Review – Is This Product Safe To Use? 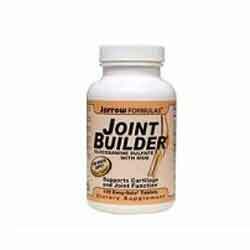 Joint Builder is a brand of supplement that caters to people suffering from chronic joint pain. Its formulation includes various clinically proven ingredients—glucosamine sulfate has been found to contribute better formation of ligaments, tendons, bones, nails, and skin. Manganese and Vitamin C foster better cartilage and collagen production. Joint Builder also has Vitamin D for improved joint health and MSM, a very popular component of many joint health supplements. Joint Builder is manufactured by a company named Jarrow Formulas. Purchasing Joint Builder through the manufacturer’s website is not possible, but a store locator is offered to help customers buy Joint Builder locally. An online locator is also available to help find the product on third party retail websites that carry it. Customer testimonials are not published on the official Joint Builder website. The formulation of Joint Builder is designed to facilitate better cartilage performance and joint health, and the ingredients included are clearly listed on the website. Also offered on the website are links pointing to clinical trials involving the Synergistic Glucosamine/MSM combination found in Joint Builder. Besides the aforementioned, there isn’t really enough information available on the website about Joint Builder and the benefits to be had from using it. The recommended dosage for maintaining joint health through Joint Builder is two tablets daily. Few people say it works. It helps you but may take long time than mentioned by the manufacturer. It has mixed reviews, hence cannot completely say it is an excellent product. The manufacturer provides very little information and the benefits that come with it on its company website, so even if they claim that the product fosters better joint health and cartilage quality, actual proof of this remains to be seen. The lack of customer feedback does not help, either. The last straw could be the fact that ordering Joint Builder through its manufacturer’s website is not possible, but a local and online store locator is provided instead to make up for this deficiency.